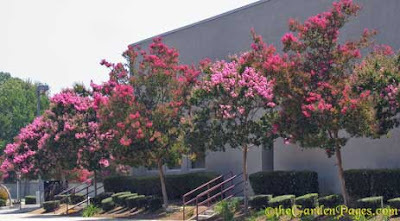 Here in Los Angeles, the Crape Myrtle Trees begin blooming around April and are still in bloom now in July, despite the 100 degree heat wave. These perennials are known for their beautiful clusters of flowers that look like crinkles of crepe paper. Colors come in bright white, dusty pinks, neon reds onto pink and purple shades, plus everything in-between. They do well in hot weather and seem able to withstand some drought once established. I love their smooth, tan bark that can peel off in sheets. These plants can be left as shrubs for a border or screen, or trained into standards or multi-trunked trees. 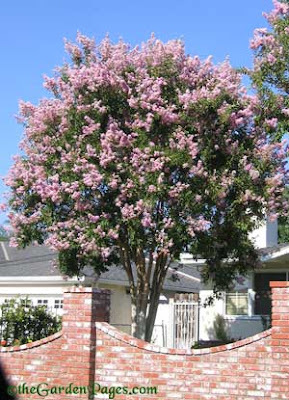 Crape myrtles have a tidy look about them and they look very stately along a driveway or flanking doors. I've seen them planted on either side of a meandering path and they look enchanting when flowering. After flowering they develop small dark berries. Don't plant them in areas where you are concerned about litter. 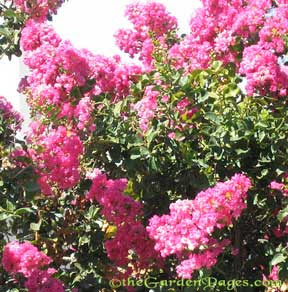 Lagerstroemia indica is native to China. They can grow up to 25 feet tall and in the fall their leaves change color into dramatic deep oranges and reds. They do well in Sunset Zone 7-10, 12-14, 18-21 or USDA Zones 7 and above. Here is a neat row of crape myrtles along a street. They have mixed hot pinks and purples together. I think if I was planting a group of them together I'd need to see them blooming together first.